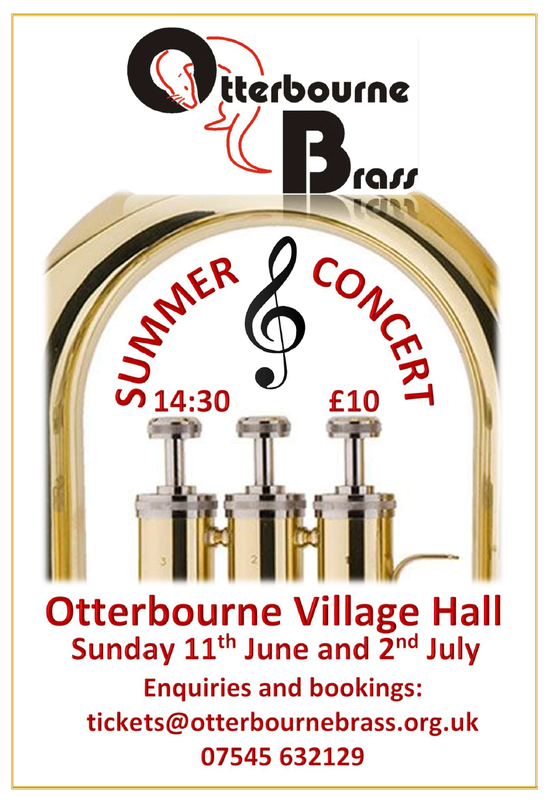 Otterbourne Brass are putting on 2 summer concerts for you, on Sunday, 11th June and on Sunday, 2nd July. The concerts will be held at Otterbourne Village hall as per previous years, with doors to open from 2pm and the concerts starting at 2:30pm. Refreshments will be available during the interval. Please email tickets@otterbournebrass.org.uk with the date of the concert you would like to book. Please indicate whether you require assistance with accessibility including reserving space for your wheelchair. To pay for your ticket by bank transfer, please contact us by email for the bank details to which you can send £10 per adult and £5 per under-16. It is important that you enclose contact details so that we can call or email you in case of any problems. All tickets will then be reserved on the door for you. If you have any enquiries please do not hesitate to contact us at tickets@otterbournebrass.org.uk or 07545632129. We look forward to welcoming you to our concerts!